This is a smooth and velvety Restaurant Style White Queso Dip that will rival your favorite restaurants Mexican White Cheese Dips! It’s made with American cheese and a few well chosen spices and it’s melted to perfection! How do you make White Queso Dip? 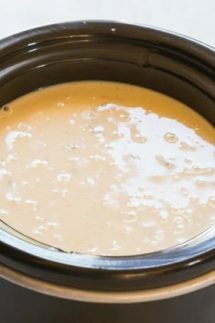 For this recipe we are sticking with the classic American Cheese, such as white Velveeta, as it is pretty close to the cheese that most Mexican restaurants I’ve been in use and if you want an authentic queso then that’s the only cheese to use. It melts really easily and without any fuss and using American cheese ensure that you get that gooey stretchy cheese thing going on that everyone loves! 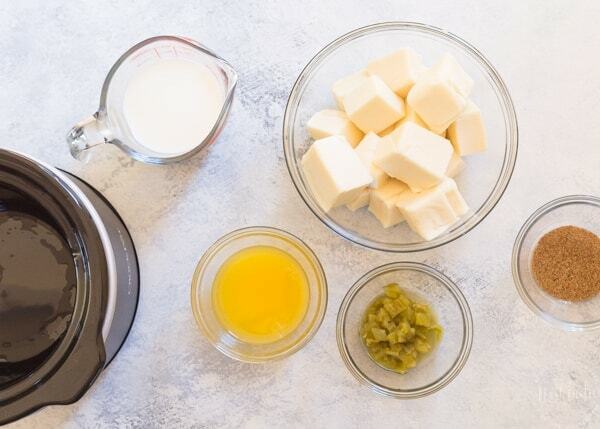 So the first thing you need to do is assemble all your ingredients for your white queso dip like you see in the photo below. We have white American cheese – I used cut up velveeta – milk, butter, canned green chilis, garlic powder, cayenne, cumin, chili powder and a little salt and pepper. Then, if you are cooking it on the stove you need to set up a pan as double boiler. This is easy to do if you add hot water to the pan and a heat proof bowl that sits in the top of the pan (not touching the water). Then you keep the water on a low simmer – do not boil – and add the ingredients and stir until its all nice and melted together. 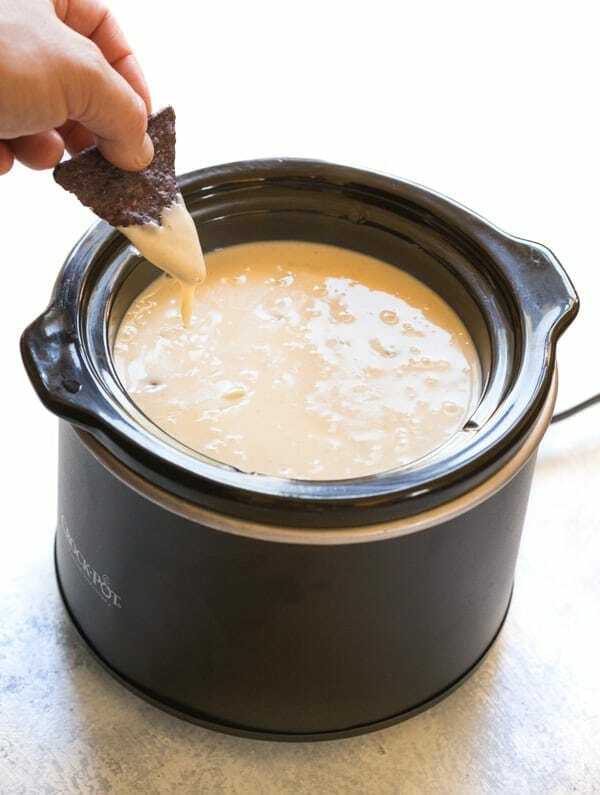 If you are making in a crockpot or slow cooker you just add all the ingredients as before, give them a quick stir and put the lid on and wait for the cheese to melt, it usually takes 30 minutes to 1 hour depending on how hot your slow cooker is. Then just give it a stir to incorporate the ingredients properly. I made it in my rinky dink Crockpot Little Dipper that’s made especially for dips. 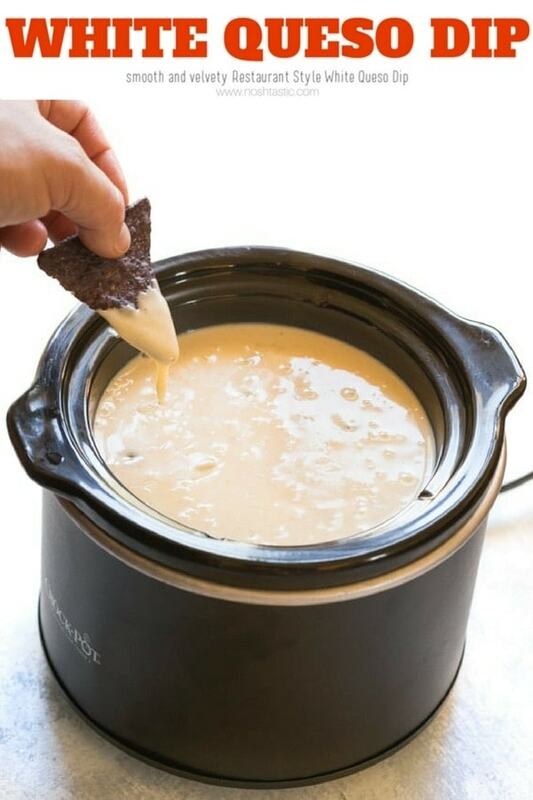 It’s very inexpensive, takes up hardly any counter space, and is great to serve my white queso dip from as it keeps it perfectly warm, it’s my new favorite kitchen toy! Smooth and velvety Restaurant Style White Queso Dip that will rival your favorite restaurants Mexican White Cheese Dip! 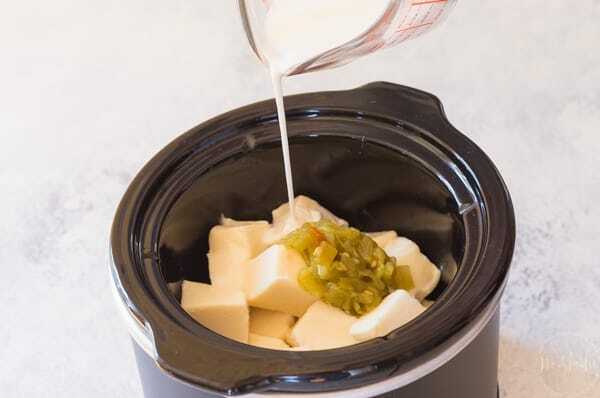 Add the white American cheese, whole milk, butter, green chilis, salt, pepper, cumin, garlic, chili, cayenne to the slow cooker and stir once and put the lid on. Cook on HIGH for 1 hour, or on LOW for 2 hours or until melted and heated all the way through. Set up a double boiler with a heat proof bowl over the top of a pan with a couple of cups of hot water in the pan, heat up the water until it is just simmering. Add the white American cheese, whole milk, and butter to the bowl and stir occasionally until it begins to melt. Now add the green chilis, salt, pepper, cumin, garlic, chili, cayenne, and stir well to combine. continue to keep stirring until all the cheese has melted and everything is well mixed.